...when you see what our nursery looks like. I think it looks like a family of small rodents could easily be taking up residence in there (except Lola wouldn't let that fly), but it's gonna turn out really cool, I promise! I know, we have a lot of work to do. This is my absolute favorite room of our house. It's on the 2nd floor and it's connected to our bedroom, which I think is neat. 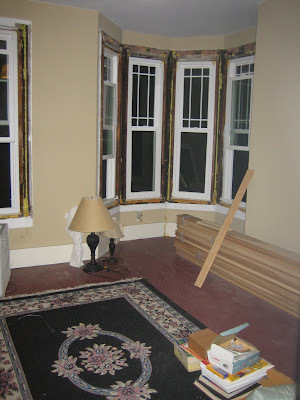 Marc replaced the windows last year and hasn't quite gotten around to doing the trim around the windows yet, but as you can see, the wood for the windows is piled up on the floor. I have a lot of great ideas but I'm all over the place with colors and styles and I can't seem to narrow it down. But suddenly the pressure is on! I'm horrible at making decisions (it took me a year to pick out my couches). My goal is to nail down my plan this weekend. We'll see. I love the wood floor and the gorgeous rounded tower section with all those large windows! That is going to be one gorgeous nursery. Very handy that it's adjoining your room. It is gorgeous already... you're right...a window seat would look incredible! Decisions, decisions. Love the room, it will be a wonderful nursery. Oh! I can't believe you are #11! That is such a small number! Does your agency have a timeline? We adopted a 3 1/2 yr old boy from Vietnam in Dec. of 06. It was the most amazing experience ever! I'm happy for you that the Dossier paperwork is done. That was so much work and I remember what a relief it was to get it out of my hands and on it's way to our agency to get to Vietnam! Love the baby's room. It will be amazing!